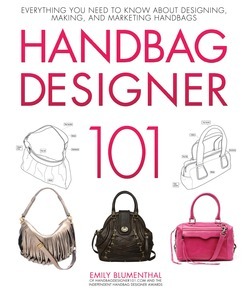 Handbag Designer 101 is the bible for handbag designers or women who aspire to make their own bags. Included in the book are instructions for creating the fifteen essential bag styles—clutch, hobo, tote, and more—made simple with easy-to-follow how-to illustrations, suggested difficulty levels, and color photography. Advice from famous bag designers and today’s hottest indie designers accompany each pattern. Also included is the inside scoop on turning your handbag hobby into a successful business. From designing, to making, to marketing, Handbag Designer 101 teaches you everything you need to know.